Jessica Wuetschner has earned a reputation of kicking unbelievable goals that leave opposition, commentators and fans alike gobsmacked. She is also known for never shying away from an opinion, as evidenced by her Twitter profile. But quite literally, the 25-year-old wears her heart on her sleeve. Two years ago, she had a large portrait of her mother etched on her right arm. “She’s my number one,” Wuetschner told lions.com.au. Wuetshner grew up with her mum Carina and dad Christian in Hobart, Tasmania. “I think both my parents are people that say what they mean and what they feel. It’s something that I’ve never really held back on,” she said. Growing up in Tassie, Wuetschner idolised her Dad as she watched him play local football. Young Wuetschner (L) shakes hands with a player following a Junior football match. On weekends she would often drag her parents out of the house to kick a ball with her. “I played a little bit as a kid, nothing really serious. I didn’t play any competitive matches after 11,” she said. She returned to football again when she was 16 years old and knew straight away she had talent. “I guess naturally I had that instinct to be able to play,” she said. In Tasmania, there are now three women’s leagues. But when Wuetschner was playing, there was just three teams across the entire state. Four years ago, at 21 years old, she decided to make a move. “There was never really a path to go down but when I saw the exhibition game I thought I need to put my talent to use and move to WA to better myself,” she said. East Fremantle was the club she called home. While there she worked at Reece Plumbing and even had a stint as a telemarketer. During this time, she earned a selection for the Western Bulldogs in an exhibition game in 2015. “For me obviously, that was a highlight of my life at the time,” she said. The exhibition game was a fateful moment in her life. It was here she met Craig Starcevich, who was coaching the Bulldogs. 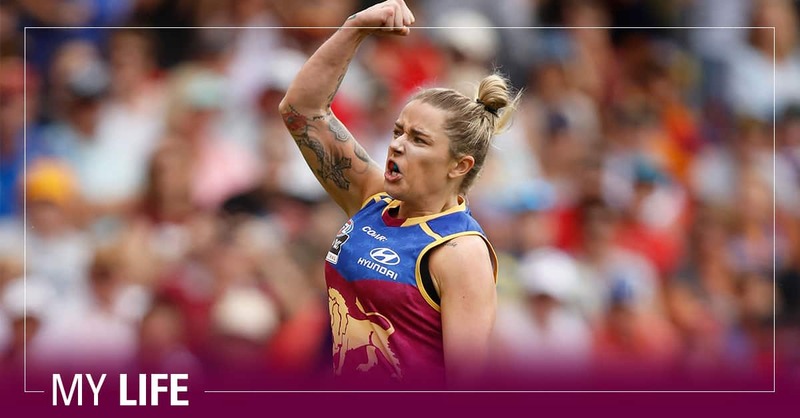 In 2016, when the AFLW was announced, Starcevich was quick to get in touch. “He sent me a cheeky text and said, ‘fancy a stint up here in Brisbane?’” Wuetschner said. Jess celebrates a goal with teammmates during Round 3 v Carlton. She thought about it, decided to apply for Queensland, and never looked back. “I think that we have a really honest relationship,” she said of Starcevich. “I think we both trust that we both know what we’re talking about and what we’re doing. “He’s almost like that older father figure that we all have. Starcevich is proud of her development across just two seasons of AFLW. “She lives and breathes footy,” Starcevich said. He says the game each week is her release. “She can use the footy field to channel all her energy for the week. From a footy perspective she is highly skilled,” Starcevich said. Wuetschner is sitting pretty as the second highest goalkicker in the AFLW this season and credits her form to the extra hours she’s squeezed in on the field. “I certainly struggled with it before getting drafted. My goal kicking wasn’t something that I was very good at,” she said. “So I just developed a routine and from there kept working on all my skills. Early arrival to training and extras outside of sessions, being careful not to exhaust herself, have been crucial. On top of this, she somehow balances her work as a stevedore at the Brisbane Port. “It can be tough sometimes,” she said. Wuetschner has little time to celebrate the team’s wins. After Saturday’s triumph over Fremantle she went back to the Gabba for recovery, went home, showered and then left for a late shift at the Port. “There’s no way you can do a full day at the port and then come to training and really get anything out of a field session. I really try to pick and choose when I work,” she said. Luckily, she is in good company out at the Port, with teammate and fellow Tasmanian Britt ‘Dozer’ Gibson also working there. They both play for their state each week and hope to do them proud.